So is there any help for a new person like me? FAQ/Answers: This will open a new tab and take you to our official answer page, which is a wealth of knowledge! Game rules: This will open the official game rules, that all players are expected to follow. Contact ingame Support: This will allow you to contact our dedicated Support Staff if you can’t find an answer to your question elsewhere. Plus Questions: If your question is specifically related to a Plus issue or feature, this will put you in contact directly with Plus Support, who will be able to answer your questions. Forum: This will take you directly to our forums, where players can converse and share new ideas. In addition to to the answers, the forums are a wealth of knowledge. 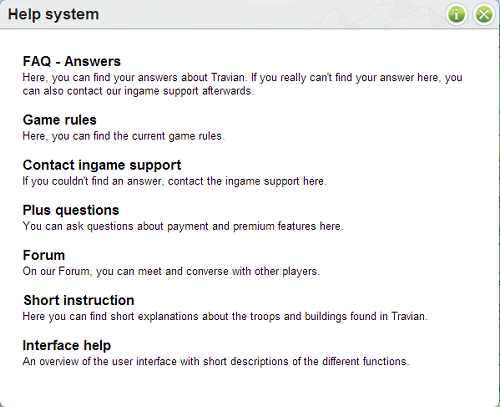 Short instruction: This will bring up the dialog that you can use to get quick information about Travian, mostly the buildings and troops. Interface help: Lastly, this will bring up an overview of the user interface with short descriptions of the different functions.